Lowdown: The story of the actions, reactions and interactions of several similarly inclined actors across several timelines. By now we are all familiar with the Magnolia formula of similarly unrelated stories told in parallel until their eventual culmination. A film using this formula, Crash, even managed to win an Academy Award for Best Picture. It is therefore no wonder filmmakers try to take this formula even further, and even less of a wonder these particular three tried just that: Tom Tykwer of Run Lola Run fame, and Andy + Lara Wachowski of Matrix glory. Yes, all three combined to direct the science fiction epic Cloud Atlas. The premises of Cloud Atlas is fairly complicated. We have on our hands six different timelines, spanning from what seems to be 19th century, through the pre World War 2, seventies, modern times, and several futuristic scenarios – including the last one, which is set in the post apocalyptic earth that resulted (more or less) from the escapades of the previous timelines. In each of these timelines we witness different incarnations of the same actors making various choices: dealing with slavery, imprisoning others, running a nuclear reactor that’s doomed to fail while suppressing the press, freeing replicant slaves, and trying to send an SOS to humanity’s members on other planets. The themes of all cases seem similar: classic good vs. evil, with characters that are pure good, pure evil, or struggling to find their way. The trick, as I have already implied, is that the same characters going through the motions are supposed to be different incarnations of the same. In order to make this point, the filmmakers resort to heavily applied makeup. Thus they are able to use the talent on their hands – Tom Hanks, Halle Berry, Jim Broadbent, Hugo Weaving, Hugh Grant, Susan Sarandon and Keith David (aka Mass Effect’s David Anderson) – in various, sometimes hardly recognizable, roles. Grant, for example, plays the seemingly nice but nasty boss of a nuclear reactor in the seventies’ setting, but also the chief of a cannibal tribe in the post apocalyptic scenario. All the stories are edited into one another, conspiring to confuse the viewer struggling to figure out what’s what but also developing together towards a common climax. I’m in contention because, generally speaking, I thought I read a different message here. My interpretation is that barring slight (but potentially important) differences, history repeats itself. Mistakes made in the past will be remade in the future, the result of mixing ignorance with human nature; however, like a Commander Shepard that needs to decide between the Paragon or the Renegade options, we also have the occasional opportunity to improve things or to make them worse; we have a choice. In other words, I was reading a more fatalistic message here than intended. Given the ambitious attempt Cloud Atlas is making, clad with actors, makeup and special effects as it is, I went wondering why I did not hear more about this movie before. However, now that I have watched it I can offer an explanation: like Icarus before it, Cloud Atlas aims too high and gets burnt. The whole affair is too convoluted, too disjointed, and dare I say too narcissistic, to work well. I still fail to see the point of some of the subplots or understand why certain things took the course they took. It all adds up, and the bottom line – the simple experience of entertaining oneself through watching a film – turns out to be less than the sum of its parts. At the end of it I wasn’t pondering the beauty of its message; I was trying to figure out its inconsistencies. 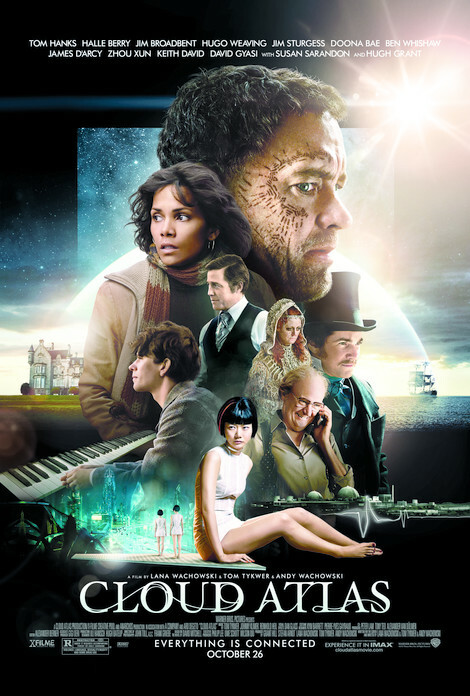 Overall: Cloud Atlas is not the worst idea ever attempted in the art of moviemaking, but it certainly aims too high for its own good. 3 out of 5 stars. Let's not forgot Cloud Atlas was a book before it was ever a movie. I disagree with your three star rating. It may be ambitious and a little confusing, but it's a movie that makes you THINK. So many movies being showed on the big screen don't let you think. You sit back, enjoy, and barely become a part of the movie. For Cloud Atlas I think the only way to have understood the movie was to have read the book. I went to the theatre and I even remember hearing people complain about the movie. I could only shake my head. You have to read the book. If you don't...well you're missing out on the point of Cloud Atlas.